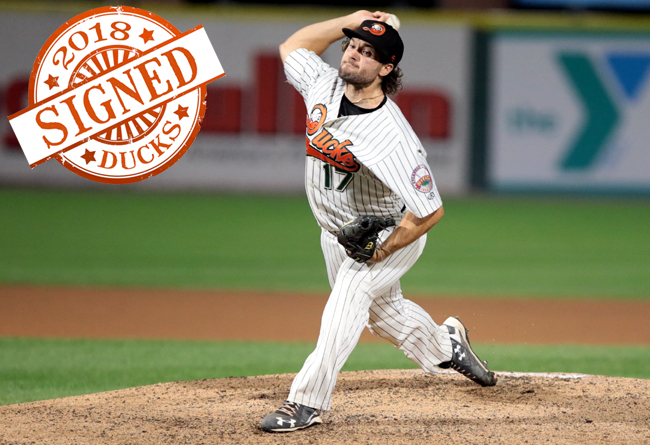 (Central Islip, N.Y., Feb. 22, 2018) – The Long Island Ducks today announced the signing of right-handed pitcher Dennis O’Grady. The Long Island native will begin his second season with the Ducks and seventh in professional baseball. O’Grady made 36 appearances with the Ducks in 2017, 15 of which were starts. He set career-highs in innings pitched (104.2) and starts (15) while tying his career-high in strikeouts (80). The righty began his season with seven consecutive scoreless innings and allowed three runs or less in nine of his first 10 outings. He took a no-hitter into the eighth inning on May 20 against the Somerset Patriots, ultimately yielding just one hit and three walks over seven shutout innings with a season-high eight strikeouts. After shifting to the bullpen in July, he gave up an earned run in just two of his final 15 appearances of the regular season. The 28-year-old went on to pitch three scoreless innings of relief in the postseason. A native of Floral Park, O’Grady spent the first five seasons of his career in the San Diego Padres organization. He split time with Double-A San Antonio and Triple-A El Paso in both 2014 and 2015. His 57 appearances in 2014 and his 80 strikeouts in 2012 with Single-A affiliates Fort Wayne and Lake Elsinore were career-best totals. Overall, the Duke University alum compiled a 25-17 record, 11 saves and 326 strikeouts over 200 appearances (25 starts) in the Padres’ system. O’Grady was originally drafted by the Padres in the 34th round of the 2011 amateur draft.